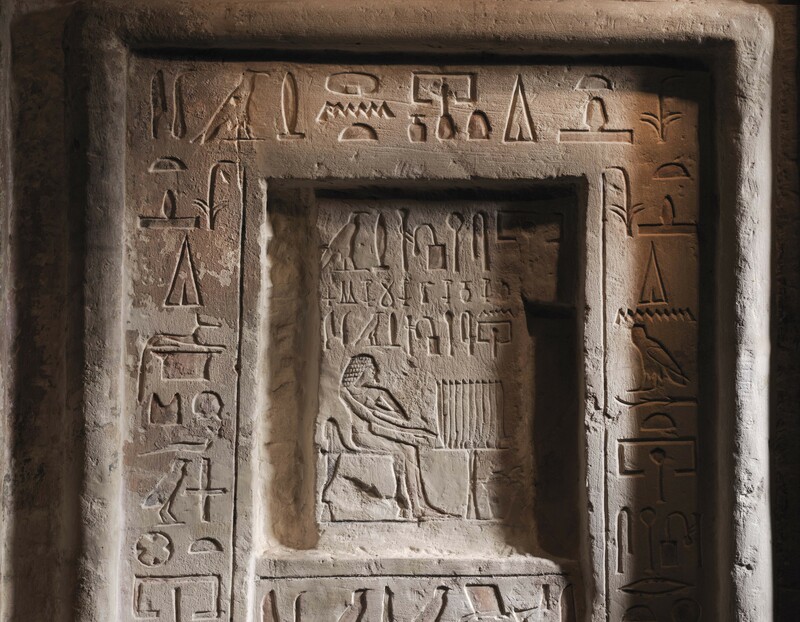 This magnificently preserved Egyptian limestone false door is carved in shallow relief and would have originally closed the entrance to a small chamber inside a mastaba superstructure; this housed a votive deity statue that was used as a vehicle for the soul to reach the afterlife. It is carved with an inner and outer frame. A miniature doorway is set below in between the jambs, at the top of which is represented a rolled-up mat hanging above the entrance. In between the inner and outer lintels of the stela is an instructive representation of the deceased kneeling in front of an offering table. The outer doorframe with torus moulding is itself enclosed within a larger doorframe. All three frames have hieroglyphic inscriptions covering their surfaces, along with three figurative representations of the deceased, named Djaty. Inscribed invocations mention the dedication of a thousand loaves of bread, containers of beer, fowls, bolts of linen cloth and alabaster vessels. The finely carved sunken relief also contains traces of blue and red pigment, indicating the original rich colour scheme. 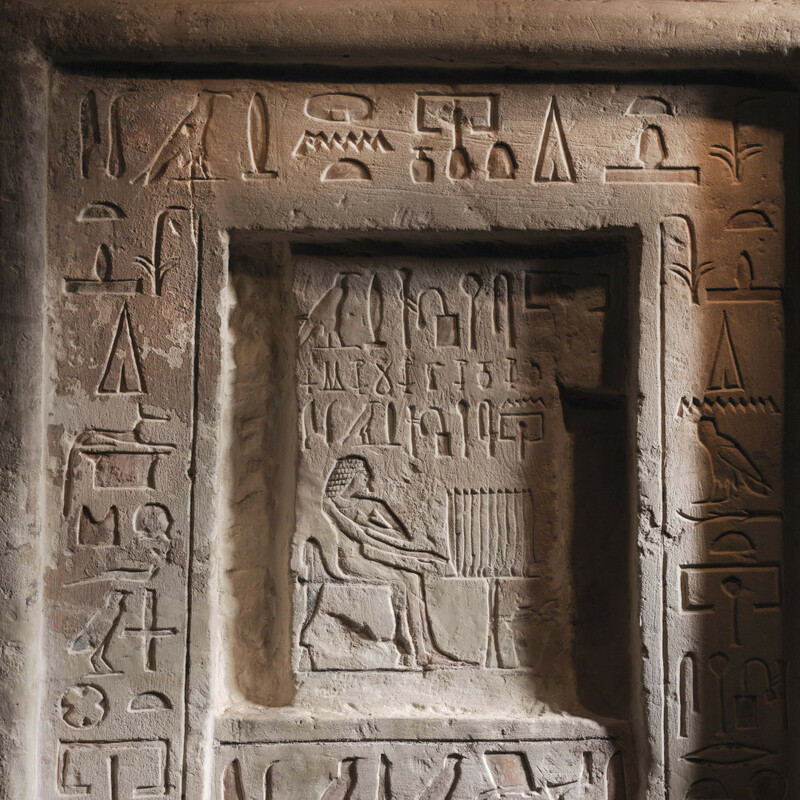 False doors like this were common throughout ancient Egypt, located inside mortuary temples and tombs. They served a passageway between the world of the living and the world of the dead, allowing the ka (the soul of the deceased) to pass from one to the next. As mystical objects, they allowed interaction between the sacred and the profane, and could facilitate conversation and the passing of offerings between this life and the afterlife. 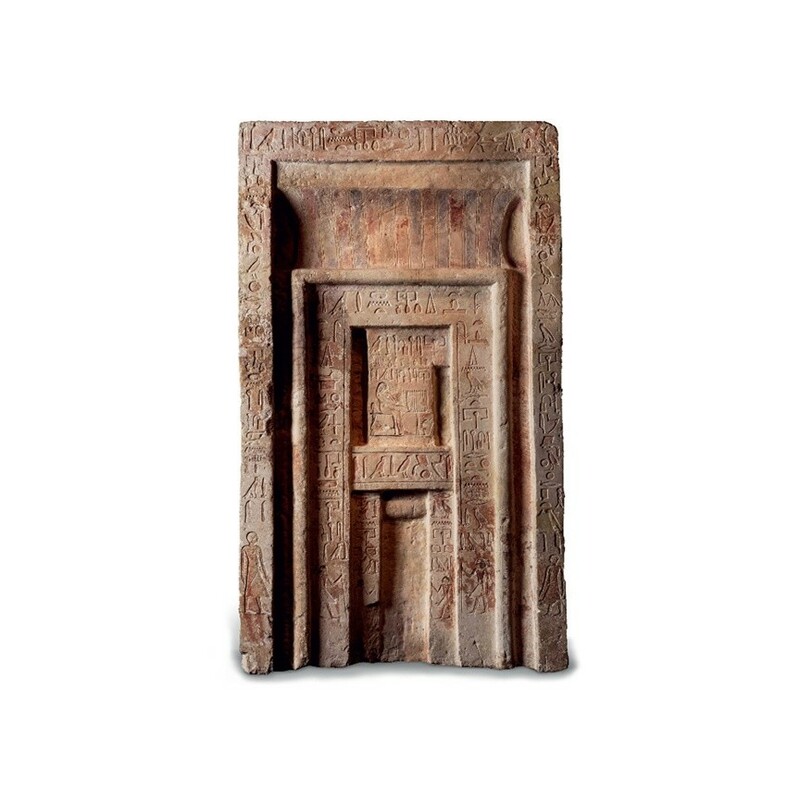 Particularly found in ancient Egyptian tomb complexes for the elite, these false doors were not intended to trick, as the name suggests, but were considered genuine portals between religious dimensions. They were located on the western walls of Old Kingdom temples – west being the direction of the afterlife – and would have been accompanied with relief carvings of processional or ritual scenes, including meat-butchering, bird-catching and religious offering. Existing in both wood and stone, false doors are important historical artefacts as they typically record the name, title and occupation of the deceased and details of their family and leading accompanying officials, as well as lists of probable offerings between man and spirit. An almost identical false door in the Musée d’Art et d’Histoire in Geneva bears the same inscribed name as ours, Djaty, described there as ‘inspector of the scribes of the treasury’. The doors share the same size, material, decorative scheme, dedication and provenance, therefore it is possible that the two originally came from the same tomb, or that the example in Geneva was from a close relative who bore the same hereditary title. The Geneva door contains a high level of polychrome decoration (possibly much restored), which suggests how the present door would have appeared with its original pigmentation, of which only traces are now left. The two doors share the same level of exquisite craftsmanship and intricate carving with harmonious architectural proportions. The similarity between these two fine doors highlights the fact that this one is certainly museum-worthy. S. Snape, Ancient Egyptian Tombs: The Culture of Life and Death, Hoboken, NJ, John Wiley & Sons, 2011. P.76. Z. Hawass, Inside the Egyptian Museum with Zahi Hawass, American University in Cairo Press, 2010, p.79. Werke ägyptischer Kunst in Munzen und Medaillen: Auktion 46, 28th April 1972, no. 19; E. Porter, R.L.B. Moss, J. Malek (eds. ), Topographical Bibliography of Ancient Egyptian Hieroglyphic Texts, Statues, Reliefs and Paintings, Vol. 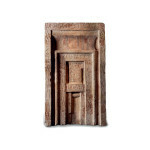 VIII: Objets of Provenance Not Known, Oxford, 2007; exhibited in Egyptian and Greek Art, Wildenstein Art Center, Houston, Texas, 1978, no. 103. Said to have been found in Saqqara, Egypt. With Marianne Maspero, Paris, 1980’s. 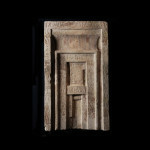 Studied by the well-known Egyptologist Professor Jean Leclant in the late-1980’s who translated the inscription. Accompanied by a photocopy of a signed photograph by Marianne Maspero dated 18th January 1990. ‘B’ Family Collection (accompanied by Spanish Cultural Passport 2016/02296). In the late 1980s, this beautiful false door was translated by the eminent French Egyptologist Jean Leclant (1920-2011) who was an Honorary Professor at the College of France, Permanent Secretary of the Academy of Inscriptions and Letters of the Institut de France, and Honorary Secretary of the International Association of Egyptologists. His excavations and research papers on ancient Egypt have been widely published and he won many prestigious awards. 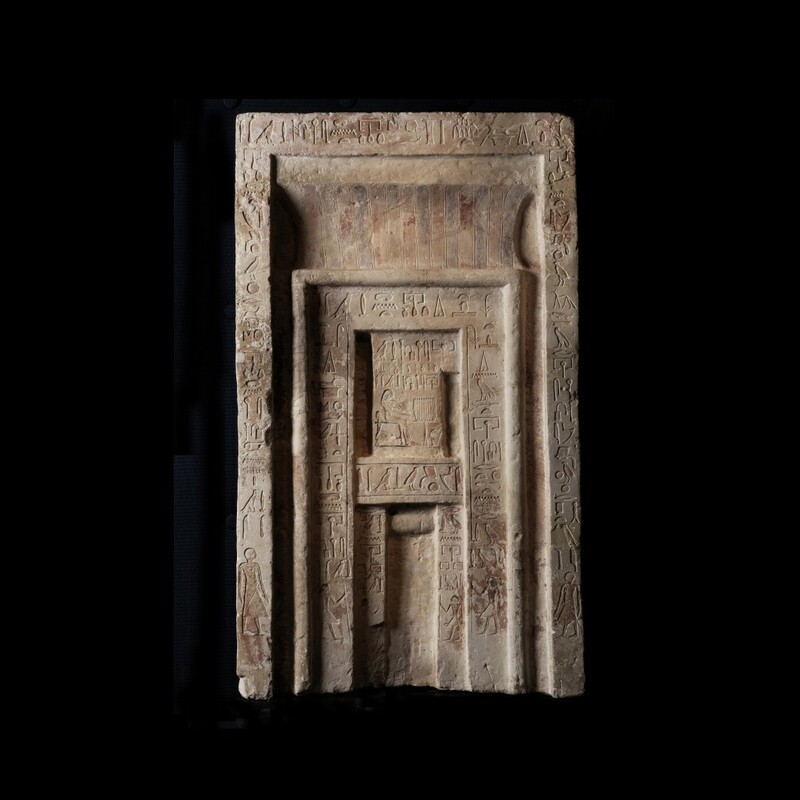 Prior to this the false door was in the private collection of Marianne Maspero (née Rusen) (b.1916), the eminent dealer of antiquities during the 1970s, 80s and 90s in Paris who placed Egyptian artefacts in many national museums including the Louvre. Marianne’s husband was the grandson of the famous Egyptologist Gaston Maspero, who invented the ‘Sea Peoples’ theory to describe Egypt’s eventual decline, all adding to this artefacts illustrious history.